After a barrage of animation over the last few years, ranging from the sublime (Up, Kung Fu Panda, Horton Hears a Who!) to the unfortunate (Fly Me to the Moon, Happily N’Ever After, Shark Tale), the thing all these recent films have in common is the fact that they are all the products of computer animation. I have reported long and loud about the intangible sensory disconnect between CGI animation and hand-drawn cartoons. Nowhere was that difference made clearer to me than sitting in a theatre watching the opening seconds of Hayao Miyazaki’s latest film, Ponyo. The gentle scene that takes us over and down through blue oceans into an undersea kingdom had the most unexpected effect of an actual warmth and calmness that came over me, reminiscent of the near-hypnotic state seizes a class of hyperactive kindergarteners the moment an adult opens a book for storytime. Anime Prozac, who knew? Often regarded as the Japanese Walt Disney, Ponyo is a variation on Hans Christian Andersen’s The Little Mermaid, which was adapted by Disney animators in 1989. 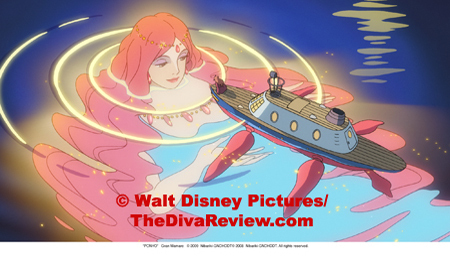 Miyazaki’s Ponyo is also a princess of the seas who wants more from her life. 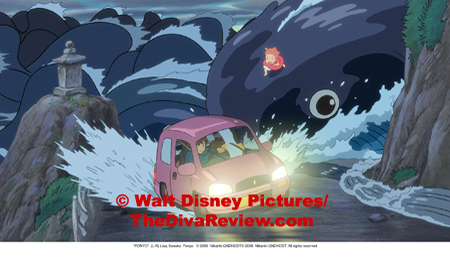 Breaking away from a cluster of similarly tadpole-like siblings, Ponyo takes advantage of her father’s preoccupation with his job of balancing the world’s oceans to make a break for the surface. Unprepared for the rush and confusion of the human world, little Ponyo has bitten off more than she can chew and is buffeted about by the busy river traffic, ending up trapped inside a glass bottle. The bottle wends its way into the hands of Sosuke, a small boy playing on a beach outside his clifftop home. 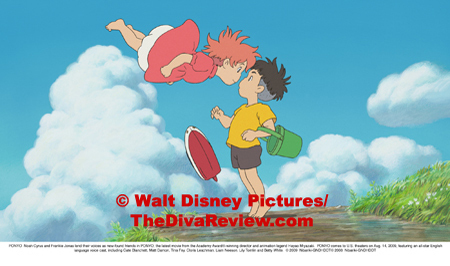 Sosuke frees Ponyo and understands quickly that this is no ordinary goldfish. After Ponyo licks a cut Sosuke suffers after breaking Ponyo’s glass prison, the red-headed fishie and the little boy become fast friends, with Sosuke carrying Ponyo in a bucket everywhere he goes. Unfortunately there’s someone else who is quite attached to Ponyo; her father scours the land and sea sending out powerful wave spirits to retrieve his lost child and return her to their undersea world. 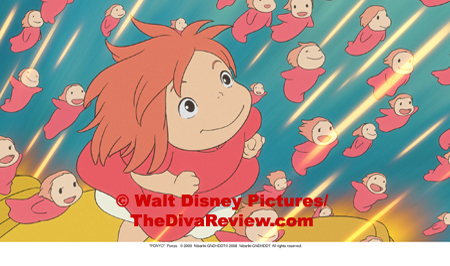 Ponyo is nothing if not a determined little herring and her resolve to see young Sosuke again makes for some very interesting changes in the little princess, who sprouts limbs in echo of her new friend. 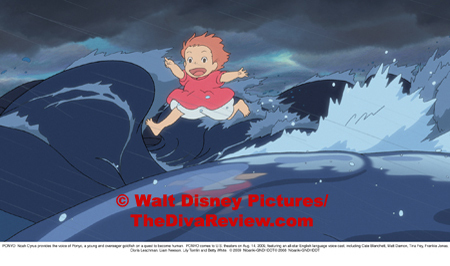 In her attempt to return to Sosuke, Ponyo accidentally upsets various magical items in her dad’s lab, causing his careful balancing act of the world’s tides to be completely unmoored. The rising waters shift the oceans, causing typhoons and all sorts of aquatic destruction that can only be put right with a test of the two young children’s devotion to each other. If they are truly meant to be then Ponyo will lose her magic, returning the world to rights once again, if not, Ponyo will die. 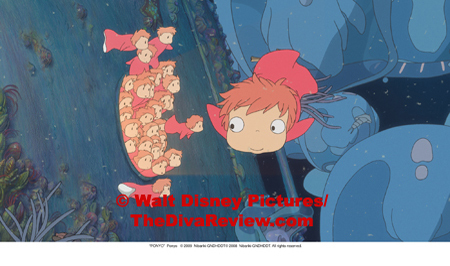 Ponyo is an odd little fish of a film; while bearing all the magic and charm that one expects of all things Miyazaki, Ponyo seems a giant step backwards for the director to his work circa the 1980’s. Indeed the art and design of Ponyo hearkens back to Miyazaki’s earlier works, like his first feature, 1979’s The Castle of Cagliostro, or Laputa: Castle in the Sky. 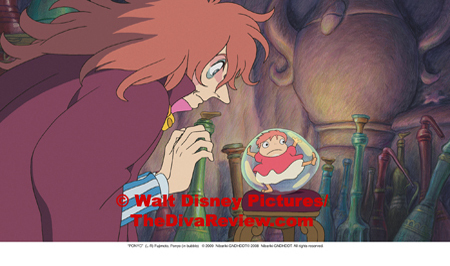 Even the look of Ponyo’s father, the sorcerer Fujimoto, is that of a 1980’s new romantic-era rock star, with his long, flowing red locks, gold earrings and puffy-shouldered striped blazer. I can’t help but wonder if after the extremely intricately detailed and technically evolved triumphs of Mononoke Hime (Princess Mononoke), Spirited Away and Howl’s Moving Castle, this look the bygone eras and styles wasn’t intentional on Miyazaki’s part? Was he winding back to the clock to get back to simpler storytelling, wowing the audience less with the stunning eye candy of seamless marauding wolves, spiraling surreal onsen and giant strolling steampunk castles, giving more due to the his characters and script? Whatever the answer, it is the characters that charm as does the story of love on different levels; the friendship between Ponyo and Sosuke, the warmth of family when Lisa, Sosuke’s mother, accepts the lost humanoid Ponyo into her home, as well as Fujimoto’s fears of letting his beloved daughter go into the dangerous unknown. 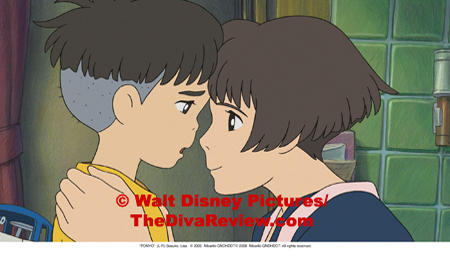 There is Lisa’s own romantic love story tested by Sosuke’s father’s long absences at sea and the strength and faith of both Ponyo’s and Sosuke’s mothers to believe in the choices of their young offspring. As per usual with Miyazaki, there are lessons about ecology and the pollution of the seas. There is also Sosuke’s deep respect and inclusion of a group of elderly ladies who live in the rest home where his mother works. That’s a lot of story to fit in one movie and I believe that perhaps to Miyazaki it may have been more important to get his points across than to dazzle. Ponyo is long on charm but after films like Spirited Away, it’s a bit of a blow to expectations to see the animation, which is undeniably, intricately beautiful – the renderings of the undersea world with its plethora of fish both modern and prehistoric, the night scenes on the on seas surface and Fujimoto’s dim but determined ocean wave spirits - but never reaches the amazement of the previous films. 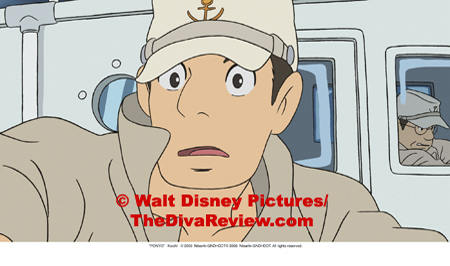 There are odd moments when the drawing style abruptly changes, warping and flattening and scenes inside Fujimoto’s submarine look as if they were drawn by children, adding to the oddness of Ponyo and my thought that Miyazaki’s focus was to keep the film lighter and more whimsical in a way his last couple of features were not. As for the English dub of the film, the voice cast for the children is a Disney bonanza with Frankie Jonas and Noah Cyrus, younger siblings of Disney’s top cash cows, The Jonas Brothers and Miley Cyrus, voicing Sosuke and Ponyo. Jonas does a fine job as Sosuke and Cyrus doesn’t have much to do as Ponyo except yell for ham and Sosuke every now and again and that becomes a bit shrill at times. Lisa is well rendered by Tina Fey, who captures the frustration of the young mother disappointed by her husband’s absences and her strength when called on to believe utterly in her young son. Cate Blanchette adds proper luminosity to Granmammare a sea goddess, whose exalted position gives her the perspective on her daughter’s life that her chosen mate, Fujimoto lacks. Liam Neeson is lovingly paternal as Fujimoto, but Neeson’s gruff, deep voice doesn’t match the character’s offbeat appearance and he seems miscast. By no means a failure, Ponyo seems more of a back-to-basics exercise for the director’s storytelling skills and in his narrative Miyazaki is wonderful. The movie’s focus on this independent little girl of the seas and her resourceful, devoted friend Sosuke is a welcome one. 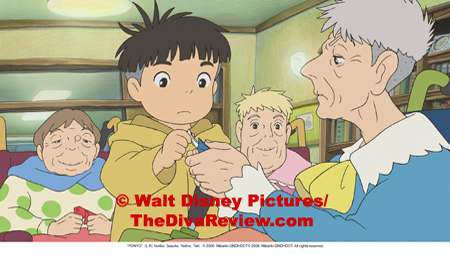 Miyazaki admirably balances the story to keep the attention equally for both little girls and boys in the audience. The subtext of the bonds of family and how they can change and evolve is worthwhile for any adult. While Ponyo is nowhere the spectacle of animation that Princess Mononoke or Spirited Away are, the beautiful hand-drawn storybook pastels of Sosuke’s village and the mesmerising swirl of colour and action of Ponyo’s world under the sea are a gentle delight. Ponyo may not be my favourite Miyazaki, but that’s comparing brilliance to brilliance. 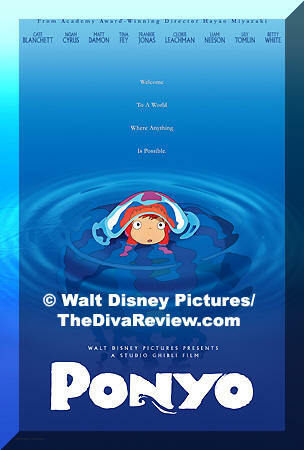 Ponyo’s charming story shouldn’t be missed.